To Cite: Aryankhesal A, Meydari A, Naghdi S, Ghiasvand H, Baghri Y. Pitfalls of Revising Physicians’ Relative Value Units (RVUs) in Iran: A Qualitative Study on Medical Practitioners’ Perspective, Health Scope. 2018 ; 7(S):e63140. doi: 10.5812/jhealthscope.63140. Background: After 30 years, Iranian health policy makers developed a new version of relative value units as a replacement for the previous one, the Californian RVUs. We aimed to identify the problems of the new version of RVUs (second edition) in Iran from perspective of health services providers in 2016. Methods: A total of 54 medical practitioners were interviewed. A content analysis approach by Elo et al., was conducted to analyze the interview transcripts. Results: Criticisms reasons are: lack of clarity of the revision process, overcoming of political lobbying on technical considerations, negligence of the evaluation and management section, ministry of health (MoH) and health insurers’ weakness in regulating and controlling the providers, Ministry of Health (MoH) and health insurers’ insufficient knowledge, lack of considering a transitional phase for implementation, and low level of flexibility regarding certain medical specialties and fields. Conclusions: Service providers raised some critical views about the technical and policy making of the new version of RVUs (second edition). They stated some pitfalls that seem to be an urgent appropriate response of the state. Pricing of health services is influenced by technical and political considerations along with certain contextual factors. The market failure in the health sector and nformation asymmetry between caregivers and patients force the government to look for appropriate policies (1). In some countries, the government is the absolute player in setting the care charges. In other countries the diagnostic related groups (DRG) is the main payment mechanism for private and public sectors (2-4). These factors are placed in 3 components of i, physician’s work; ii, expenses of medical services provision; and iii, mal-practice probability. These components are adjusted by the geographic practice cost indices (GPCI). If the RVUs are multiplied by monetary value called conversion factor (CF), the fee for each service is defined (8, 9). The previous system of valuing the health services in Iran is adopted from the Californian RVUs. Hence, determination of health care tariffs has been a heated debate among main stakeholders, which often reached a consensus through political processes rather than technical (10). An authority called “supreme health insurance council” (SHIC), whose members are from different regulatory and payer organization, is responsible for approving the health tariffs. Nonetheless, the providers believed their services were not valued on the basis of the economic facts and therefore, demonstrated their dissatisfaction on and on. They tried to compensate the gap between approved tariffs with the so-called “real tariffs” through the informal payments or induced demand (11, 12). For more than 3 decades, the out of pocket payment was the main source of health care financing in the country (10). However, after implementing the health transformation plan -2014- the government tried to revise the relative value units in Iran after 30 years. But due to the fact that the physicians’ and providers organizations’ pressure the MoH, it was decided to revise the Californian RVUs (13). The goals were to set real monetary values for health services, reduce the inequality between medical practitioners’ earnings, reduce the informal payments, value the new procedures, services, interventions as well as cares, and revitalize the medical fields such as infectious diseases specialists, internal medicines, and pediatrics that did not have much financial attraction for the medical students. The RVUs revisions included considerable changes in the related values. A sample of revised codes is compared with their old versions in Table 1. Regarding to the changes in RVUs, we aimed to identify the pitfalls of the new version of fees schedule based on the localized RVUs (second edition) in Iran from the perspective of providers in 2016. In the time of conducting the study, there were 163 approved medical associations and societies by the MoH, which 34 associations and societies were invited and involved in revising process of the national RVUs. Therefore, a purposeful two-stage sampling was used to collect the data. Firstly, 34 scientific medical associations and societies were selected, then, a sample of 54 members was included until we reached information saturation about the difficulties and pitfalls of the revision. The inclusion criteria for participants were either of: i, being introduced and approved by the correspondent associate/society; ii, having good information about the RVUs, based on their own statements; or iii, having research in the field of RVUs. A list of interviewees has been presented in supplementary file Appendix 1. A total of 54 face-to-face interviews (that 20 of them were done through telephone) interviews were accomplished. The time of interviews ranged from 36 minutes to 65 minutes with an average of 49 minutes. All the interviews were accomplished on July 2016 to September 2016 by H.GH. The interviews included 4 sections: a brief description of research, questions about the demographic characteristics, questions about participants’ level of satisfaction with the current version of Iranian RVUs (second edition), and finally the more deep questions about the new RVUs’ shortcomings. The ethics committee of research of study funder approved a consent form. The form has been read and signed by interviewees. - Preparation: all of the recorded interviews have been transcribed point by point. - Reporting: the relevant codes, themes, and categories based on the CMS framework and statements of the interviewees have been extracted. The demographic characteristics of interviews and then the main results have been presented in this section. Most participants believed that the new version of RVUs had not worked well for resolving the existing problems. Their rationales for such views are categorized in 11 sub-themes and 7 themes, Table 2. Low level of flexibility about certain medical specialties and fields Regulating everything may not be the best option. Determination of values in RVU schedule requires a scientific and evidence-based process. The participants believed that the political power of the associations/societies was the main determinant of RVUs. The visits and consultations were not considered in the new version of RVUs. Of course these sections were neglected in the old version as well, however, most experts expected them to be included in the new version. The ignorance of the (E&M) section in the Iranian RVUs has led to another problem for physicians, due to the fact that now the valuing of visits and medical examinations is different from the RVUs. The MoH and payers are not able to deal with informal payments and over-charged bills. Hence in new localized RVUs, the SHIC decided to merge different medical codes together and then calculate their related values through averaging. The MoH and health insurers should have enjoyed medical groups’ knowledge and experiences in revising the codes. The MoH and SHIC developed a simplified version of RVUs rather than a localized one. “The MoH and SHIC involved themselves in a pure technical action in RVUs, which they did not have detailed knowledge in. The explanations of codes and valuing them are specific work expected to be accomplished by medical groups or associations/societies (P. 24)”. The MoH should have undertaken adequate studies to prepare the field through a transitional phase. The in-filed studies and review of related experiences across other nations were not conducted. The MoH is now facing unpredicted consequences. The new version of RVUs includes different criteria for calculating the value of all services. However, level of expertise, experiences, and skills of practitioners are not considered. Over the past 3 decades, the Californian RVUs were the common tool for determining the fee schedules in Iran (2). Most of participants believed that the new version (second edition of new version) of RVUs had serious challenges for the Iranian health system. The participants concerned the low clarity and transparency of revising process and unconvincing rationales. All of the revisions, their roots, and the outcomes should be documented and available for the main stakeholders. This can make an atmosphere of trust among most stakeholders. The Center for Medicare and Medicaid (CMS) makes such an atmosphere through the updating committee that receives comments from different parties and make them post it after drafting a new version (14). The SHIC should have obligated the technical aspects of valuing health services to multidisciplinary teams with more active contribution of medical associations/societies. The CMS agreed about 87% of changes offered by the committee and they emphasized on the importance of capacity building by CMS for strengthening of its abilities in analyzing the technical aspects of valuing the health services (14). Defining a logical process for adjusting the physicians’ fees has been highlighted by Ginsburg et al. (9). Setting medical tariffs through the resource-based valuing mechanisms should be based on technical processes. However, the process involves certain political considerations caused by pressures of different stakeholders, especially medical groups. 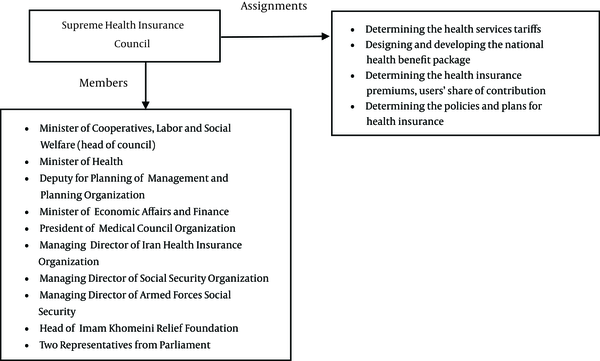 A study in Iran shows that, one of the main dimensions for valuing the health services associates with the governance power. This highlights the role of political pressures of influential medical groups in determining the values of health services (15). The role of political lobbying and need to manage its side effect on the revising or updating the physicians’ fee schedule as a challenging debate has been discussed by 2 previous studies in USA and Canada (16, 17). Revising the physicians’ fee schedule is a long-time process, which needs a sufficient in-field study and should be accomplished through both transitional and implementation phases. This was concluded in a study in the USA (18). However, in Iran, due to the instability of managerial conditions, any government tries to accomplish the national plans in the shortest time and therefore, the feasibility studies are not usually performed. This was the case about the revision of the RVUs. The Iranian practitioners had adapted themselves with the Californian RVUs and then gradually, the equilibrium through the informal payments and induced-demand had been materialized. The CMS considers 2 mentioned phases including the transitional and implementation, the first usually comes some years earlier than the latter. The RAND Corporation conducted a study about the unification of CFs for all defined groups of practitioners in 2012 and the CMS decided to implement this through 2017 (19). The Evaluation and Management are very important in diagnosing the diseases and laying out the effective treatment The Iranian health policy makers have implemented a simplified method to value the E and M services in out-patient settings through calculating the unit cost of provision of in-office visits and consultations, which is totally different from RVUs. A study concluded the shortcomings of RVUs in valuing of E and M and requirements of updating new topologies for these services (20). In one study, the researchers have compared the numbers of the office visits and their completeness in the USA and Canada. They concluded that in Canada, this is more summarized, and depending on the state there are some limitations in reimbursing the physicians (17). The considerable gap between the incomes of different groups of physicians is a historic problem in Iran. A study showed that the low level of values for non-invasive services lead to an inequitable distribution of income among medical groups (21). Such a problem is not specific to Iran. In Japan, the current payment system led to an inequitable earnings. The researchers concluded that scopes of surgery and other medical activities should be separated and also, the difficulty and the efforts of manpower in providing the services should be modeled (22). In Iran, the FFS payment mechanism can result in induced demand. Therefore, the state should develop appropriate controlling mechanisms (13, 23). Using the prospective reimbursement system is among current advice for reducing the financial burden of RVUs (24-26). The logic behind any adjustment in the RVUs should be explained for medical groups so that there is no lack of clarity for such stakeholders about the changes. The issue of equity in RVUs, should be considered by involving different medical groups in the revision process. The demand side of the health market should be controlled by the in-charge bodies and by ruling out the traditional FFS payment and implementing prospective mechanisms. Finally, the MoH should consider designing the modifiers properly. Many of the participants did not eagerly show a tendency to speak about the advantages of the new version of RVUs. Conflict of Interests: The author confirms that there are no competing interests between them. 1. Waters HR, Hussey P. Pricing health services for purchasers--a review of methods and experiences. Health Policy. 2004;70(2):175-84. doi: 10.1016/j.healthpol.2004.04.012. [PubMed: 15364147]. 2. Langenbrunner J, Cashin C, O'Dougherty S. Designing and implementing health care provider payment systems: how-to manuals. World Bank Publications; 2009. 3. Kumar A, de Lagasnerie G, Maiorano F, Forti A. Pricing and competition in Specialist Medical Services. 2014. 4. Graham JD. Medical care prices in the United States: Private dominion and the relative-value scale. New Proposals: J Marxism and Interdiscip Inquiry. 2009;3(1):23-32. 5. Burns BJ, Phillips SD, Wagner HR, Barth RP, Kolko DJ, Campbell Y, et al. Mental health need and access to mental health services by youths involved with child welfare: a national survey. J Am Acad Child Adolesc Psychiatry. 2004;43(8):960-70. doi: 10.1097/01.chi.0000127590.95585.65. [PubMed: 15266190]. 6. Baadh A, Peterkin Y, Wegener M, Flug J, Katz D, Hoffmann JC. The Relative Value Unit: History, Current Use, and Controversies. Curr Probl Diagn Radiol. 2016;45(2):128-32. doi: 10.1067/j.cpradiol.2015.09.006. [PubMed: 26545579]. 7. Johnson SE, Newton WP. Resource-based relative value units: a primer for academic family physicians. Fam Med. 2002;34(3):172-6. [PubMed: 11922531]. 8. Maxwell S, Zuckerman S, Berenson RA. Use of physicians' services under Medicare's resource-based payments. N Engl J Med. 2007;356(18):1853-61. doi: 10.1056/NEJMsa063258. [PubMed: 17476011]. 9. Ginsburg PB, Berenson RA. Revising Medicare's physician fee schedule--much activity, little change. N Engl J Med. 2007;356(12):1201-3. doi: 10.1056/NEJMp068272. [PubMed: 17377156]. 10. Zare H, Akhavan Behbahani A, Azadi M, Masoudi Asl I. Assessment of methods for determination of medical tariffs in developed countries and proposing a model for Iran [In Persian]. Majlis & Rahbord. 2013;20(74):5-34. 11. Nekoeimoghadam M, Esfandiari A, Ramezani F, Amiresmaili M. Informal payments in healthcare: a case study of kerman province in iran. Int J Health Policy Manag. 2013;1(2):157-62. doi: 10.15171/ijhpm.2013.28. [PubMed: 24596856]. 12. Keyvanara M, Karimi S, Khorasani E, Jazi MJ. Experts' perceptions of the concept of induced demand in healthcare: A qualitative study in Isfahan, Iran. J Educ Health Promot. 2014;3:27. doi: 10.4103/2277-9531.131890. [PubMed: 25013820]. 13. Moradi-Lakeh M, Vosoogh-Moghaddam A. Health Sector Evolution Plan in Iran; Equity and Sustainability Concerns. Int J Health Policy Manag. 2015;4(10):637-40. doi: 10.15171/ijhpm.2015.160. [PubMed: 26673172]. 14. Laugesen MJ, Wada R, Chen EM. In setting doctors' Medicare fees, CMS almost always accepts the relative value update panel's advice on work values. Health Aff (Millwood). 2012;31(5):965-72. doi: 10.1377/hlthaff.2011.0557. [PubMed: 22566435]. 15. Doshmangir L, Rashidian A, Akbari SA. Unresolved issues in medical tariffs: Challenges and respective solutions to improve tariff system in Iranian health sectors In Persian]. HOSPITAL. 2012;10(4(39)):21-30. 16. Holahan J. Paying for physician services in state Medicaid programs. Health Care Financ Rev. 1984;5(3):99-110. [PubMed: 10310601]. 17. Katz SJ, Zuckerman S, Welch WP. Comparing physician fee schedules in Canada and the United States. Health Care Financ Rev. 1992;14(1):141-9. [PubMed: 10124435]. 18. Mitchell JM, Hadley J, Gaskin DJ. Physicians' responses to Medicare fee schedule reductions. Med Care. 2000;38(10):1029-39. doi: 10.1097/00005650-200010000-00007. [PubMed: 11021676]. 19. Wynn BO, Liu H, Mulcahy AW, Okeke EN, Iyer N, Painter LS. Implementing a Resource-Based Relative Value Scale Fee Schedule for Physician Services: An Assessment of Policy Options for the California Workers' Compensation Program. Rand Health Q. 2014;4(2):7. [PubMed: 28083336]. 20. Kumetz EA, Goodson JD. The undervaluation of evaluation and management professional services: the lasting impact of current procedural terminology code deficiencies on physician payment. Chest. 2013;144(3):740-5. doi: 10.1378/chest.13-0381. [PubMed: 23764970]. 21. Babashahy S, Akbari Sari A, Rashidian A, Olyaee Manesh A. Payments of physicians employed in public and private hospitals after modification of surgical and invasive services tariffs [In Persian]. Hakim Health Syst Res J. 2012;15(1):38-43. 22. Hayashida K, Imanaka Y. Inequity in the price of physician activity across surgical procedures. Health Policy. 2005;74(1):24-38. doi: 10.1016/j.healthpol.2004.12.005. [PubMed: 16098409]. 23. Doshmangir L, Rashidian A, Moaeiri F, Akbari Sari A. Effect of proposed changes of relative values of different specialists medical tariffs on payment weight of specialties and health system costs [In Persian]. Hakim Res J. 2011;14(1):1-9. 24. Centers for M, Medicaid Services HHS. Medicare program; revisions to payment policies and five-year review of and adjustments to the relative value units under the physician fee schedule for calendar year 2002. Final rule with comment period. Fed Regist. 2001;66(212):55245-503. [PubMed: 11760761]. 25. Jegers M, Kesteloot K, De Graeve D, Gilles W. A typology for provider payment systems in health care. Health Policy. 2002;60(3):255-73. doi: 10.1016/S0168-8510(01)00216-0. [PubMed: 11965334]. 26. Miller HD. From volume to value: better ways to pay for health care. Health Aff (Millwood). 2009;28(5):1418-28. doi: 10.1377/hlthaff.28.5.1418. [PubMed: 19738259].